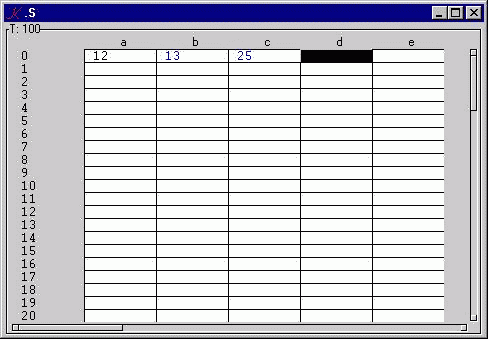 A spreadsheet is a visual matrix of functional dependencies. A cell may contain data or a function definition. S, S+, and S- are K implementations of essential, extended, and minimal spreadsheet functionality. The foreground of a0 is black. b0 and c0 are blue, to indicate calculated values. The formula is interpreted to mean: a0+a1+a3+...+a99. Observe that a2 knows to exclude itself from the set of summand cells. Labels are "inert". They are rendered using a gray background. Press the escape key to restore the previous value and clear the error. A formula may consist of any valid K expression, including arbitrary functions and variables. Names beginning with a dot are evaluated over the K tree. 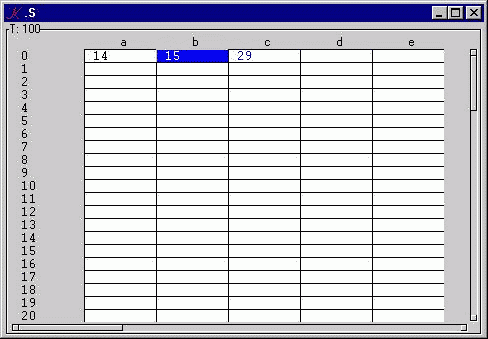 A spreadsheet is an instance of the variable .S containing a table T with columns C and rows !N. T[c;r] is the value of cell cr, for c in C and r in !N. The value of the empty cell is 0. 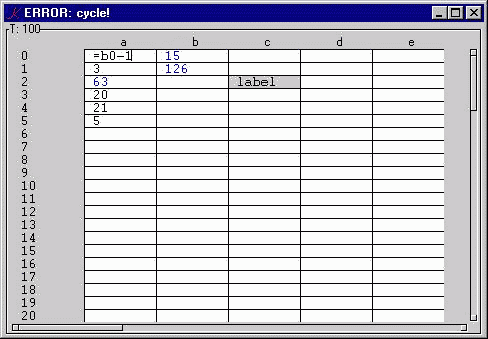 A cell can be associated with a formula which computes its value. 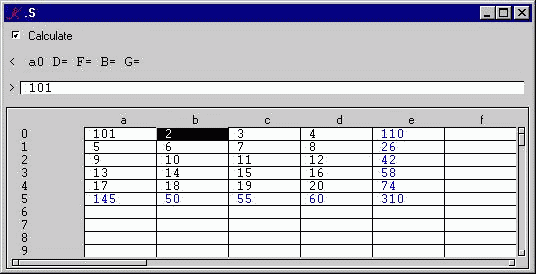 The formula is stored apart from the value, in the formula table X. The executable representation of the formula is stored in Y. Two tables Z and ZZ contain lists of cells derived from the formulas in X. Thus, Z[c;r] is a list of cells used by X[c;r]; that is, the cells on which T[c;r] directly depends. ZZ[c;r] contains a list of cells which directly use T[c;r]; that is, the cells whose formulas contain occurrences of cr. X, Y, Z and ZZ are modified when a formula is entered into a cell. The formula is parsed, and information derived during parsing is stored in Y, Z, and ZZ. The formula itself is stored in X. When an update is applied to cell cr, the spreadsheet is selectively invalidated. Selective invalidation marks only those cells which depend on the updated cell. ZZ[c;r] is processed recursively until cells are reached on which no cells depend. After all cells which depend on cr have been marked invalid, all marked cells are recalculated and restored to the valid state. 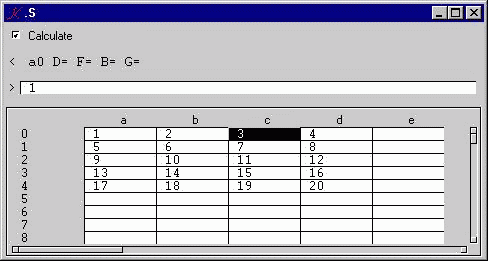 cr is invalidated by appending (c;r) to V, the list of invalid cells. cr is validated in two steps: first, replace T[c;r] with the result of executing Y[c;r], and then remove (c;r) from V.
When T[c;r] is cleared (by entering a naked equality symbol), the corresponding cells of the formula and dependency tables X, Y, and Z are cleared, and (c;r) is removed from each of the lists Z ./:Z[c;r]. That is, if T[c;r] depends on ds, then (c;r) is a member of ZZ[d;s]. In order to clear T[c;r], (c;r) must be removed from ZZ[d;s], the list of cells which depend on ds. T[c;r] is displayed in one of three colors: black, if it is not a formula-cell; blue, if it is a formula-cell and is consistent with the cells on which it depends; and red, if it is a formula-cell and is not known to be consistent. When T[c;r] is updated from the screen, the input string either begins with = or it does not. If the string begins with =, then either a formula is being defined or a cell is being cleared; in each case, W is set to (), the empty list. If the string does not begin with =, then a value is being entered, and W is set to (c;r). Thus, W records whether the last update was a formula definition (or clear) or a value update. If cr, the cell to be displayed, has no formula, then W is irrelevant: draw cr black. If cr has a formula, then draw it red if W~(c;r), else draw it blue. Suppose there is screen input to T[c;r]. K calls the S parser T.c..g on the input value, which is always a string. The result of T.c..g is then assigned to T[c;r]. The S trigger T..t fires. Invalidation occurs, followed by validation. When T..t is finished executing, every cell in T is valid. Those cells in T which have changed are re-drawn to the screen. Each cell-draw involves a pair of K function-calls: one to T..f, to format the cell-value as a string, and one to T..fg, to draw the cell-foreground in the appropriate color. .S.T is a K table: a directory of equal-length lists. 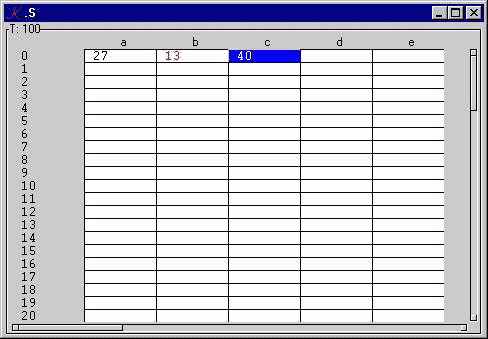 K programs can update spreadsheet cells by assigning values to variables in T. In this, the basic model, assignment is limited to cellular, that is atomic update. This restriction is lifted in S+ by extending .S.T..t, the trigger on T.
The complicated business in the second rule ensures that a column can contain its own aggregation. For example, if T[`b;5] is defined to be +/a, then +/ is translated by the if-clause of the second rule, since *K is `b, not `a. But if T[`a;5] is defined to be +/a, then *K is `a, and the else clause of the rule is used, since we want to exclude T[`a;5] from the sum over column a. Unless otherwise noted, x is the path to the spreadsheet instance, and y is a cell-index. For example, functions called under an update .S..T[`xyz;17] will see `.S for x, and (`xyz;17) for y. In what follows, I will often refer to T[`xyz;17] as y.
that formula-cells are empty until they have been validated. begins with a cell-name is deletgated to spl. e.g. : the formula a12-3 is parsed ".s.get[_d;(`a12)]-3"
return canonical cell id (`col;row). return instance `. ... instance. 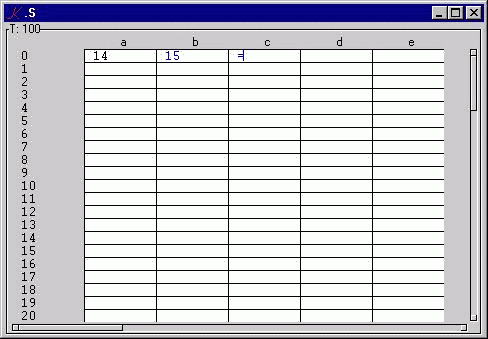 .S is a typical spreadsheet instance, or template. an update to any variable in T will cause .s.act to be called. list; W is a cell. An alternate-input field I has been provided for several reasons. 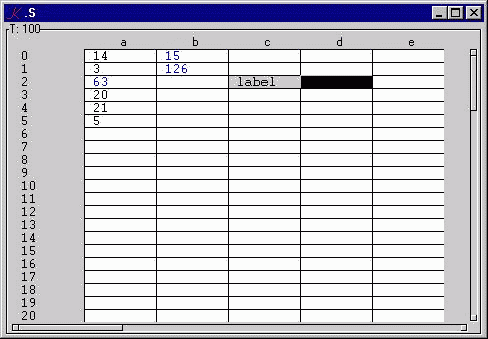 First, the formula-definition of a cell can be displayed and edited. Second, the canonical form of a cell-value can be displayed using 5:. Third, label-valued cells can be edited (since they are always output-only in the extended version). 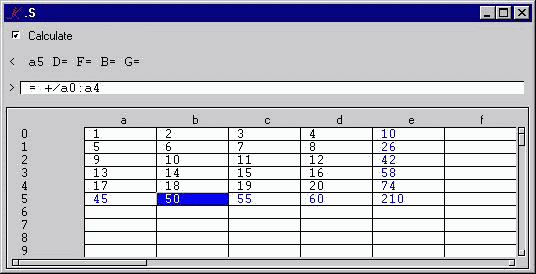 Updates to the alternate input field are applied to the current cell, the index of which stored in the variable K.
In the basic model, changing the value of a cell on which other cells depend causes the immediate recalculation of the dependent cells. There are circumstances in which immediate recalculation is expensive (if the calculations are costly) or misleading (if the intermediate states of the calculation are meaningless). 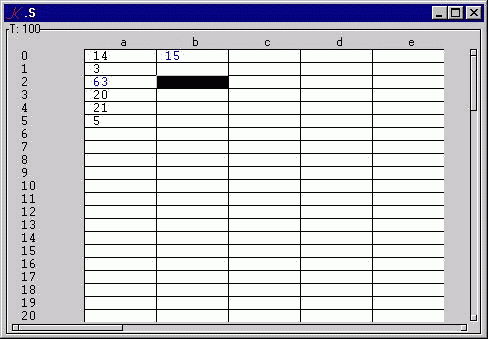 Immediate recalculation also means that, if a spreadsheet is updated from a program source (e.g. 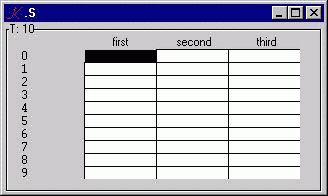 a real-time feed), then it cannot be used interactively. A recalculation-checkbutton has therefore been added. With recalculation on, invalid cells are immediately validated. 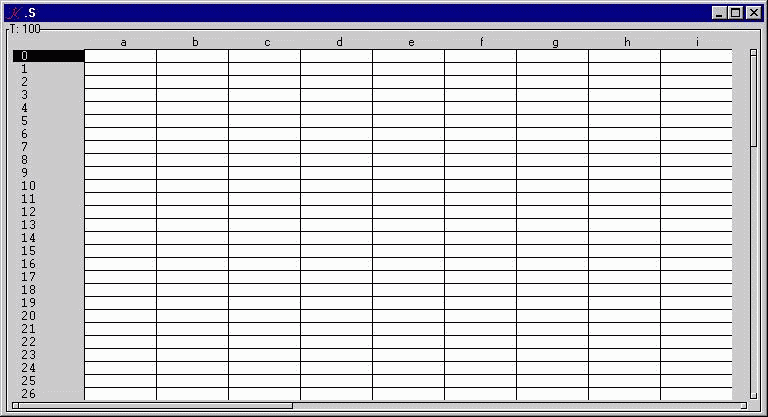 With recalculation off, the list of invalid cells accumulates until the switch is turned back on, at which point all invalid cells are recalculated. The state of being invalid-and-displayed (which cannot occur if calculation is on) is signalled by graying-out the background of the cell. Thus, for example, if c0=a0+b0, and recalculation is on, then an update to a0 will cause c0 to recalculate, as will an update to b0. With recalculation off, c0 will be added (once) to the invalid list, and updates to a0 and b0 will have no effect on c0's value until recalculation is turned back on. In the basic model, the only form of programmatic assignment to T is cellular (atomic); for example, .T.a:101. In the extended model, the trigger function has been designed to detect and respond to any form of indexed assignment. 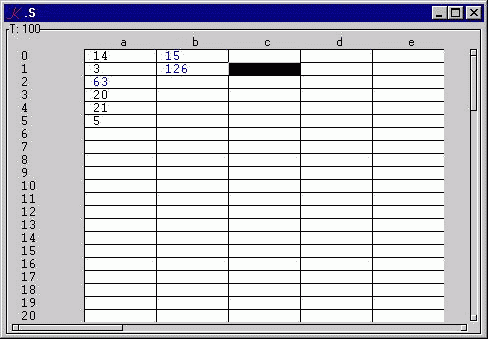 The extended model consists of a form .S with four components: the Calculate button, which controls recalculation; Q, the current contents of the selected cell; I, the alternate input field; and T, the spreadsheet itself. Turn off Calculate, update a0 and c3; a5, c5, e0, e3, and e5 are invalid and pending. 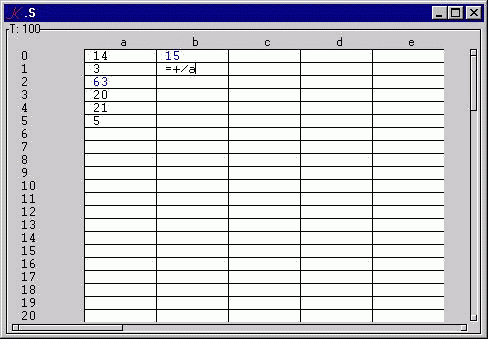 The S- spreadsheet may be the minimal K implementation (Arthur Whitney, 1995). Formulas are entered without a command letter, but in K notation. For example, the formula a0+b22 is defined: a+b. Labels are entered as in S/S+, as strings: "abc". Input is not processed; there is no parsing in S-. S is a table of strings on the screen. D is a table of values. For example, if a0 is 12 and b0 is the formula a+1, then S.a is "12" and S.b is "a+1", and D.a is 12 and D.b is 13.
and the value 2 is entered in S[`a;0]. There is no g function, so "2" is accepted and assigned to S[`a;0]. The trigger S..t fires and performs two pieces of work. First, S is re-evaluated, element-by-element, in the directory D, and the result of each evaluation is stored in the corresponding position of D. The value of D[`a;0] is now 2, and that of D[`b;0] is 3. 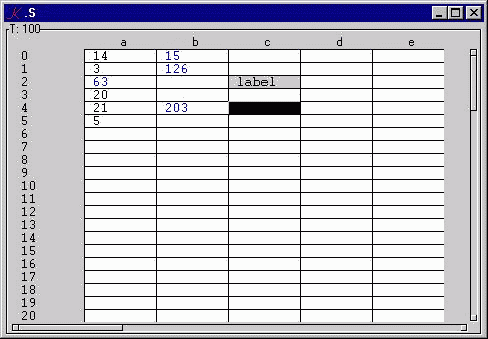 Next, the f attribute of each variable in S is assigned the formatted values in D. After the trigger completes, the contents of f are written to the screen. 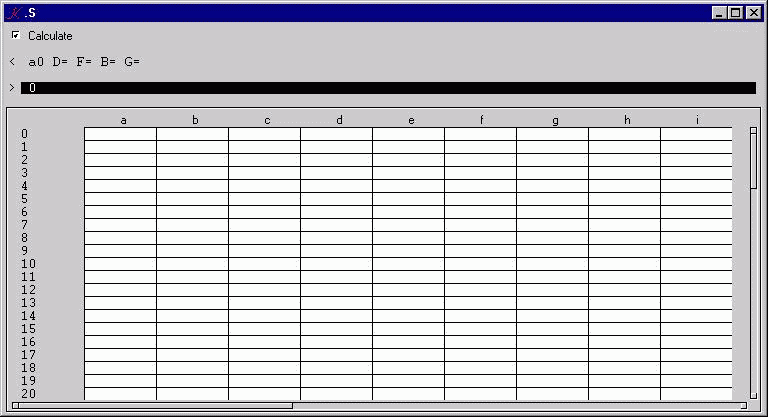 Copy the scripts for the three spreadsheet programs to a directory s.
depending on whether you want to use the basic K spreadsheet S or the extended version S+.